Each year, the University of Auckland Foundation sends funds entrusted to it for specific educational charitable purposes into investment pools that, right now, could include the very companies that are contributing to the emissions pathways that the Intergovernmental Panel on Climate Change warns we must rethink entirely if we are to meet the challenge of climate change. Fossil Free University of Auckland was formed in response to our university’s continued investment in dirty energy and fossil fuel companies. As part of the global 350.org climate justice movement, Fossil Free University of Auckland has one key ask: for the University of Auckland to divest from fossil fuels. Divestment requires organisations such as the university to pull their funds from the coal, oil and gas industry to send a clear message to these companies that we do not support their extractive, harmful work. We are a group of students from across many faculties who recognise the importance of fighting climate change to achieve climate justice for all – and we want The University of Auckland to be on the right side of that fight. Despite not having received a full divestment commitment from the University of Auckland, we are seeing encouraging signs that our campaign is making an impact. The 2017 Sit-In of the Vice Chancellor’s wing of the Clock Tower and subsequent protest march led to the creation of a fossil-free portion of the University of Auckland Foundation fund. 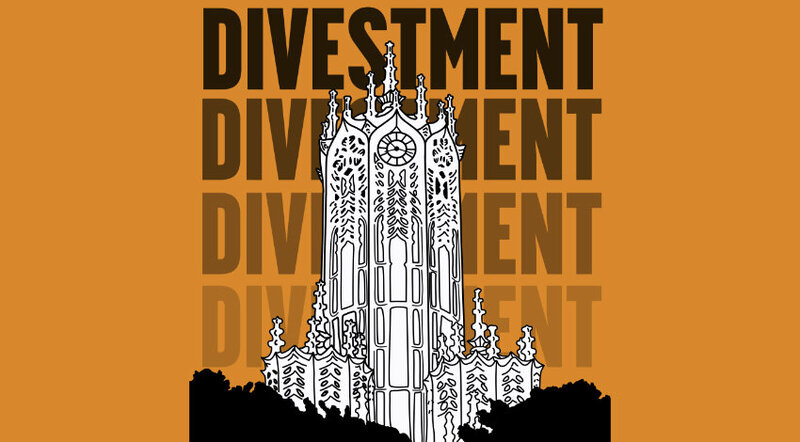 More recently, our report to the University Council outlining the financial, moral and ethical reasons for divestment lead to a successful, near-unanimous vote by the Council to develop a report investigating the practicalities of divestment for the University. While these partial wins have shown the power of student-led activism on campus, we cannot ignore the most significant roadblock in our campaign currently – the Vice-Chancellor, Stuart McCutcheon. Mr McCutcheon has continuously refused to show any support for the movement and, due to his influence within the University governance, has prevented divestment. We as a group are eagerly anticipating the appointment of Mr McCutcheon’s successor at the end of this year and look forward to working alongside the new Vice-Chancellor to achieve a fossil free University of Auckland. Fossil Free University of Auckland is part of a global movement and as such, we are at the mercy of global opinion and trends. In the age of Trump and the rise of alt-right nationalism, climate change and how it should be dealt with are locked in constant debate and acts of discreditation. While some politicians or organisations spread messages of separation, of us and them, the movement against climate change is one which brings all people of all backgrounds together to fight back against a threat that will impact all of us – no matter which walk of life we come from. This duality was represented no more starkly than on 15 March 2019. A day which showed so much positive, inclusive and meaningful climate action as thousands of school students marched for action on climate change was overshadowed by an act of hate, terror and separation. The response to the Christchurch terror attack showed that even in the darkest of hours, the humanity we all share can continue to shine through. To create action on climate change, we must ensure this humanity continues to shine through. If we are to challenge climate change deniers, we must come together as a species and resist the continued exploitation and destruction of Earth, our only home. Divestment is but one of the ways that this can occur within the current economic and governance models that we have. In a world where money speaks, divesting removes the capital that fossil fuel companies rely on to expand their operations and helps revoke the social license to operate. While some ideologies constantly threaten to undermine climate change action, there are glimmers of hope that we are starting to see systemic change. The Labour-NZ First-Green coalition government has ushered in a new era of reform for New Zealand environmental policy, one which is not just focused on national parks but also our holistic impact on the environment. Most central to this is the ban on new oil and gas exploration in Aotearoa. This sends the message that New Zealand is no longer interested in upholding an industry which has been proven to be destabilising our climate. While this move will have real impacts for those people who work in the industry, we believe the opportunities that exist for a low carbon economy will far outweigh the loss that this ban brings to the New Zealand economy. Fossil Free University of Auckland hopes that the actions of this government will provide positive support and guidance for organisations such as the University to go fossil free and embrace divestment as a logical step in the right direction. Fossil Free University of Auckland is surrounded by like-minded groups on campus who share the same passion for a sustainable society. We regularly collaborate with the likes of Sustainable Future Collective (SFC) and Generation Zero in a variety of on-campus activities and events such as Potluck Dinners, Movie Nights and discussion forums. SFC and Generation Zero along with the multiple other sustainability groups on campus are full of individuals working to help society live within the boundaries of the planet. If divestment doesn’t sound like your thing but you want to get involved within the sustainability sphere, we highly recommend checking these groups out!